Clapton on "Layla." Slash on "November Rain." Page on "Stairway to Heaven." These are the guitar solos that made ordinary axemen into rock gods. If you've got an epic guitar solo that's at least 10 seconds long, we've got the perfect opportunity for you. Upload your track to our Guitar Player "Take The Lead" Competition between now and August 17. Our fan community and the Guitar Player editorial staff will decide whose solo rocks them like a hurricane. One Grand Prize winner will score a feature in Guitar Player magazine and a year's supply of strings and accessories from Ernie Ball! So tune those strings and get shredding! Participants must be thirteen (13) years of age or older at time of entry and must reside within the forty-eight (48) contiguous United States and the District of Columbia. 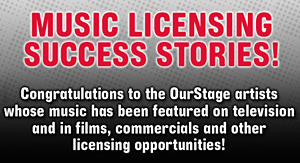 Only submission materials that are determined, at the sole discretion of the Sponsors, to be classified as Alternative Country, Country, Traditional Country, Alternative, Hard Rock, Indie Rock, Metal, Modern Rock, Punk, Rock, Soft Rock and Southern Rock as defined on the OurStage FAQ's will be deemed valid entries.